I have been heart broken lately by article after article on Facebook of Church People leaving the church, bashing Christianity, and feeling as though they are better off outside the church. The problem I am seeing, though, is that these people are leaving sects of the church that are not Biblical to begin with and calling out Christianity along with falsities. There is so much false doctrine out there, circulating both inside and outside the church that people's views of Jesus are obscured. Social media makes it so easy for anyone to write a blog on his or her opinion of what one Scripture says. These seemingly insignificant people who are writing and luring readers into "their" movements are becoming more and more rampant. The casual church culture lures out children and our teens with seemingly Biblical truths. They ask, like Satan in the garden, "does the Bible really say that," or what's "so wrong with..." I read a woman's account just this week of how she was divorcing Christianity, divorcing her husband's view of family, and divorcing a particular movement they were a part of. As I read her article, I agreed with her argument against her husband's view of family and her argument against the particular movement. The problem is she had so associated programs and human perspectives with Biblical doctrine that she could not untangle the web. This woman has allowed herself to believe that the Christian relationship is as flawed as her family's theology. We must view pieces of Scripture in light of the entire Bible. We can't base theology on teachings of people or one single Scripture passage. It leads to feelings of defeat and disdain toward the church. So, what do we do? How do we reach out to women like this one, and how do we train our children and church members in such a way that they see truth for truth? First, I think we have to go back to the basics. Scripture is the basis for my relationship with Christ, not what my pastor says or what a book says or what a really neat commentary proposes. There are thousands upon thousands of Scripture-based books out there. Only the ones that align themselves with all of Scripture (and not just a passage) can be viewed as good. And even then, we need to be careful. Anytime we begin to view an author or pastor or book as equal to Scripture or complementary to the point of necessary, we fall victim to devaluing the Word of God itself. Jesus is all about community and doing life with other like-minded believers. However, our God must remain our God and ruler and our doctrine must remain the Scripture. Anytime a community urges that other things become just as priority as God and His Word, that community is teetering on a cult and is no longer Jesus' image of community for the Church. Third, we need to teach our kids and teens and Bible study members (etc) the WHY behind our convictions. I had a conversation with my mom about why a particular sin is so rampant in our church culture in this modern time. We came to the conclusion that it is because parents and leaders are not doing a good job teaching the why behind convictions, allowing false doctrine to slip in with the real. If we water down our convictions and teach our kids Bible stories without doctrine, we fall prey to raising an ignorant generation, easily susceptible to false doctrine, sects, and loose convictions. I think that's exactly where the church is today. We are a body of people so unsure about what is Scripturally sound that we listen to anyone who sounds intelligent. We must prepare for the false doctrine that is infiltrating our church, our social media, and our lives. Jesus tells us in Matthew 24 that in the last days many false prophets will rise up and lead many astray from the Gospel. I pray that we will search Scripture, recognize truth for truth, and love on those who have been jaded by these false doctrines so that they will recognize truth and come to know Jesus for who He really is. It is time that we stand up for Scripture and stand up against false doctrine. All Caught Up! This is actually a current #SavilleLife blog! Yay! 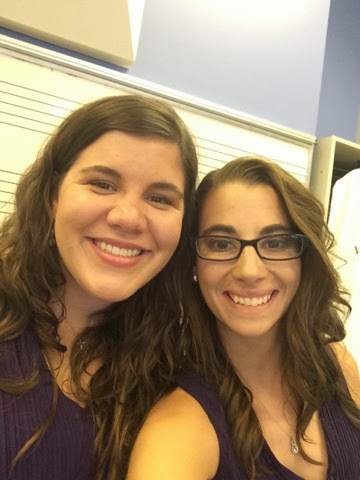 See what we've been up to this week! Keep up with us on Instagram by following @1988Megan and #SavilleLifeInPictures2014. Day 257: Showered this sweet baby who came into our family early. Congratulations Caroline and Everett! We love sweet Everly. Day 258: Spent two hours here today. At least Morgan's phone is now in working order. Genius Bar...hmm, not really! The things we do for the people we love! 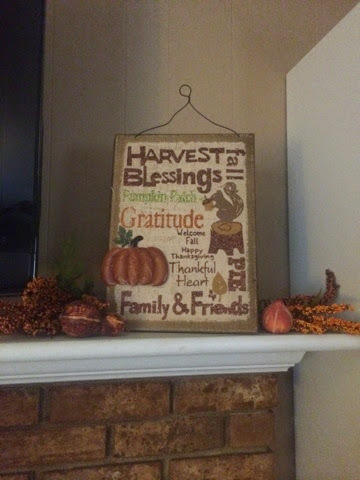 Day 259: It's fall y'all. 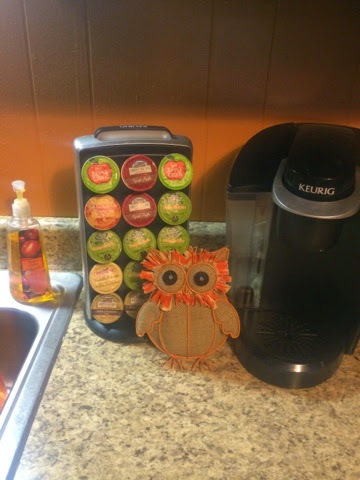 My coffee station and the rest of the house are screaming of fall. See the whole house on the blog here. Day 260: Look what fun fall addition my mom made for me! She's so talented! I'm So obsessed with fall stuff! Day 261: A new book, dark chocolate and raspberry gelato, and coffee. Yeah. This is happening right now! Some things just make a girl happy. Day 263: Spent the day apple picking with all of my people (Minus Morgan). So much fun! We are hardly spontaneous, but when we are, we have a great time! I'm so grateful for the people who make up my #SavilleLifeInPictures each week. Life would be so boring if we went at it alone! Just because my pictures haven't shown up on the blog in about a month doesn't mean I haven't been taking them! You're about to experience a #SavilleLife overload! Get ready for it, blog world! Day 229: Dedicated our preschool playground to sweet Mrs. Patsy this morning She has always been so impactful in the lives of students. I pray I, along with many other teachers and students, can be just as impactful this year. Day 230: First day of school selfie! 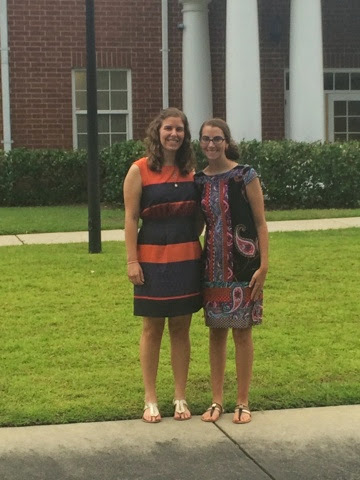 From 6th grade to XC practice to the mortuary and finally to do a grad school assignment--it was a full day of exciting first day things! Day 233: ...and this was just from one day! Boy, it has been super hot after school, but I love running with the XC team. Day 234: Dessert! Love a QT Slushie and quality time spent with friends! Day 235: Had such a fun time celebrating Lindsey! Couldn't wait for the wedding. And yes, these pictures are of me wayyyy up high on a ropes course. Day 236: Fantasy draft day! Love some fantasy football with friends. Day 237: Getting ready for the best season-football season! Day 238: Apparently, it was national dog day! Here's to the crazy fellow I'm happy to have in my family (on most days). Love Moxie! Day 239: Palmetto Middle School iPad rollout was a success, albeit a little chaotic! Day 240: This was one for the books! Grateful for my husband on this day who helped me attack the infestation that has been a struggle in my car. My arms and legs are covered in ant bites...all from the inside of my car! Day 241: PHS selfie at the start line for Midnight Flight 5k. I love these people so much. They're great kids! Day 242: It's a football watching kind of Saturday! I'll try to do better at keeping up for the remainder of the year, but you can always keep up with me on Instagram @1988megan! 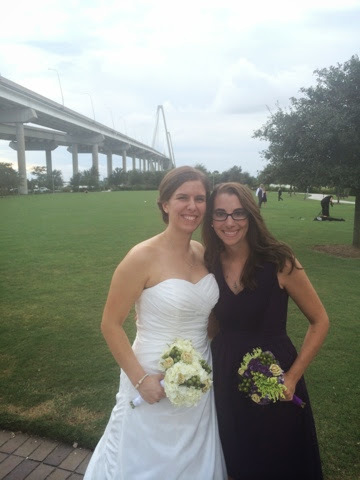 My sweet college friend Lindsey got married on Saturday. 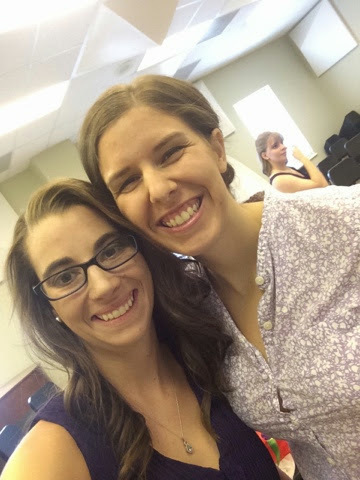 It was such a fun time to catch up with her and see her and Anthony's love for one another and for Christ on display. Linds and me at the rehearsal. The dinner was at RB's. Yum-o! It was so neat to hear Lindsey and Anthony's friends and family from all different stages affirm their growth in love for The Lord and one another. I'm so proud of this girl. On Saturday, Moose and I had a lazy morning of watching American Ninja Warrior at the hotel until it was time for me to meet up with the bridal party. 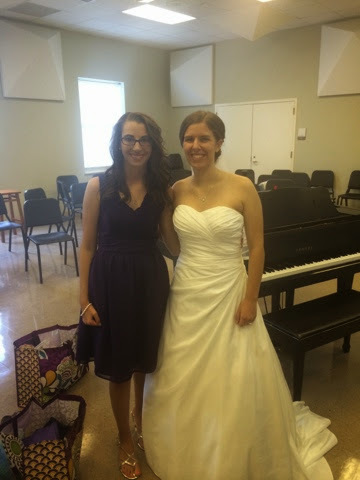 Alex and I were the Clemson friend bridesmaids! Love this girl. Right after she put her dress on. So beautiful! 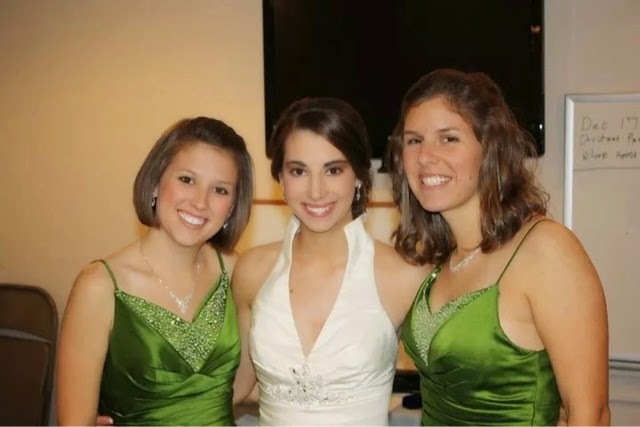 The wedding was so sweet and Lindsey's nieces and nephew ALMOST stole the show completely. ;) they were awesome flower girls and ring bearer-bribed only by purple M & Ms and prizes galore! We had a neat time of worship during the ceremony and the Gospel was definitely the center of the ceremony. 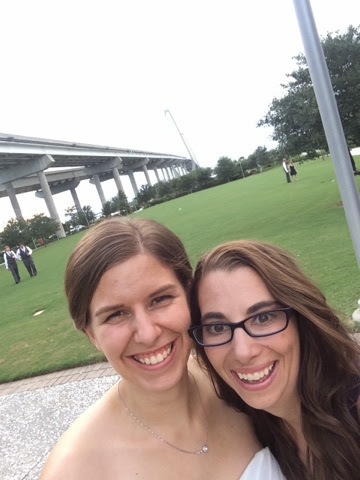 The reception was in a beautiful venue directly under the bridge. A Lindsey wedding would not be complete without her favorites-boiled peanuts, cheer wine, shag dancing, Krispy Kreme, family and friends. Everything went so smoothly and everyone had a great time dancing and enjoying their donuts and Cheerwine. Also. I promise my husband was at this wedding. We even had a cute picture taken. However, the photographer (and one of Lindsey's Charleston roommates) took it on her real camera, so at the moment I don't have evidence. We had to scoot out a little early from the reception, as we were heading home through Columbia and Carolina was in the 4th quarter of an incredibly close game with UGA. We ended up facing a little rain and traffic, but got out in time to beat the worst of it. I love the fall. Each of the seasons is fun and I enjoy the newness of them all, but I can say with certainty that I enjoy the fall most. The cooler weather is perfect, it is football season, and the color scheme is my favorite! I just love browns and oranges and warm tones all nestled together. There's something cozy about fall! A harvest welcome to you all! 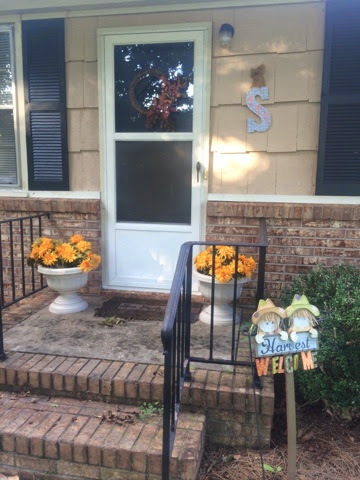 The sign came from Hobby Lobby last year, I made the fall wreath, and of course I put some fake mums in my urns. If I had real ones, I would have to trash them by October, so I use fake for a splash of color. 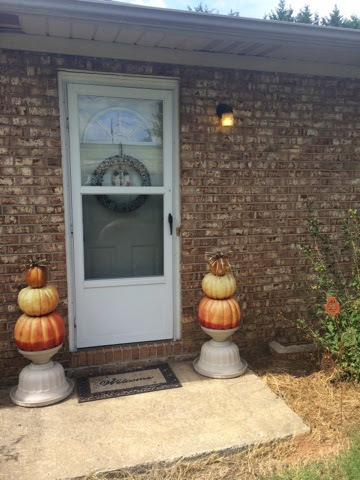 Closer to October, I think I will put some live pumpkins on the steps. Also, I have a brand new glass front door. It's been in my building since May. My pictures would be SO much improved if I could switch them out! The back door and door most people use. I flipped my urns upside down for these pumpkin topiary trees. 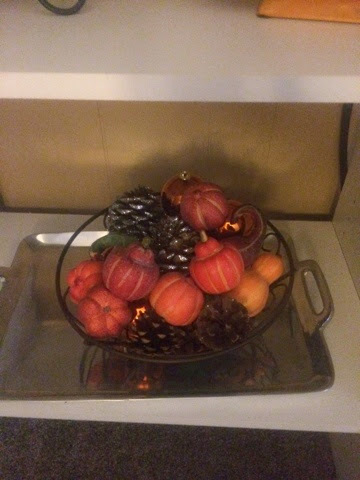 I bought foam pumpkins at AC Moore and stacked them using wooden skewers from my kitchen. 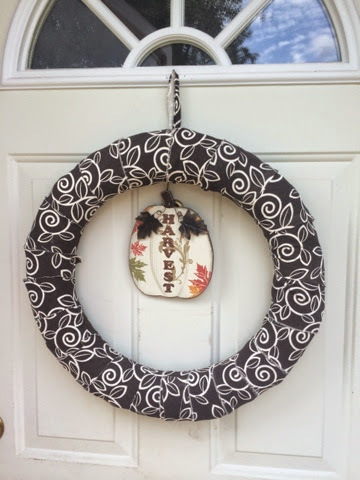 I wrapped a wreath frame with some scrap fabric and hung this cute plaque from the center for my door. 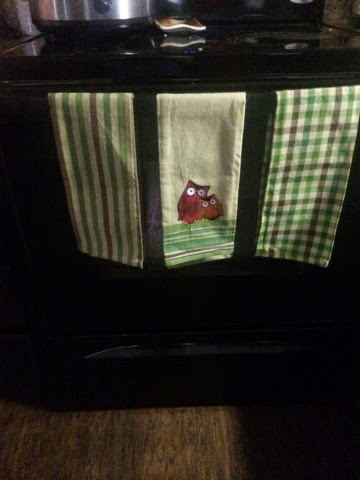 I love my little owls. I wish I had 4 or 5 more of these little owl guys! Mom suggested that I needed some fall berries. 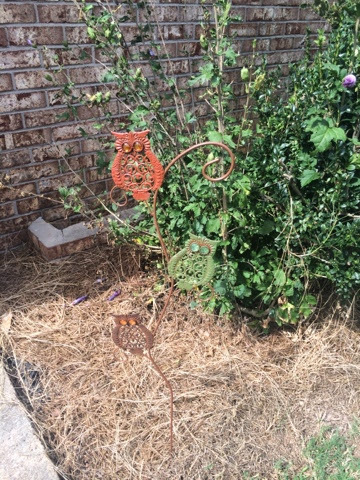 I found these sprigs at AC Moore for 70% off and used them throughout my house. 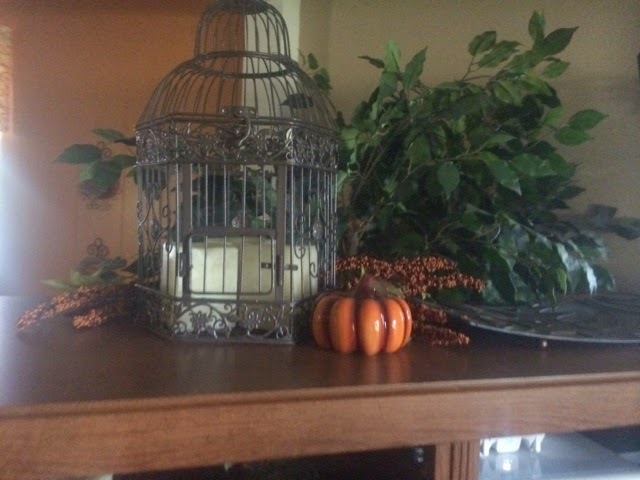 My bird cage is one of my favorite year-round decorative pieces. 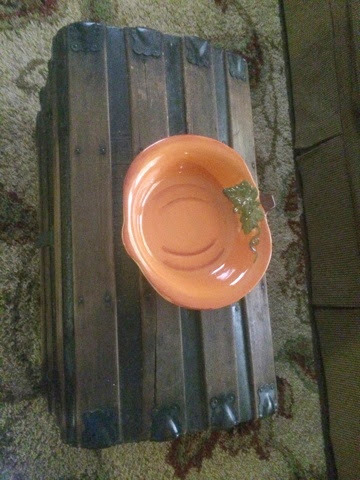 A friend gave me this super cute pumpkin bowl. More owls. I'm a little (lot) bit of a fan! I love my little gourds. 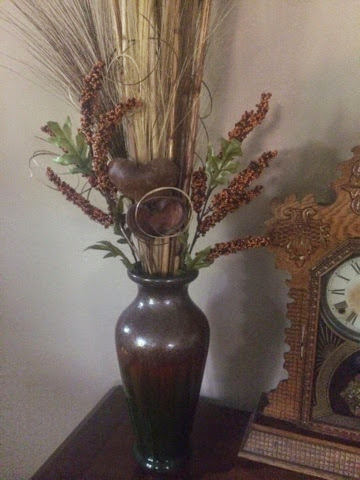 They came from the dollar store and I spiced them up with some sparkly pine cones from Hobby Lobby. 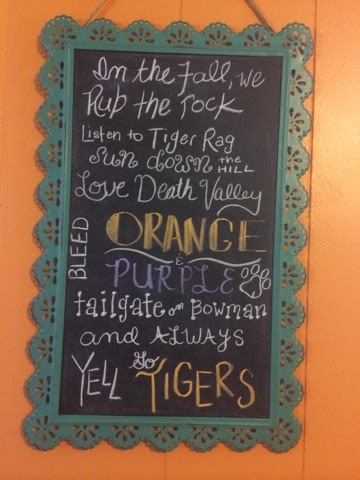 My chalk art tells of our favorite fall past time. 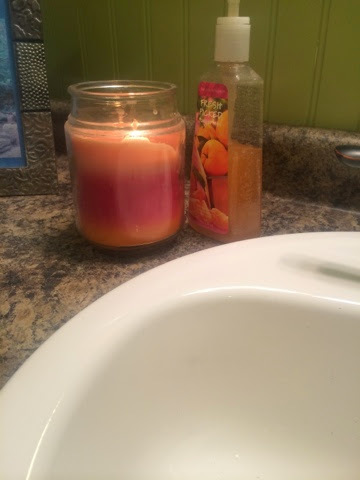 And my favorite soap and candle in the bathroom! 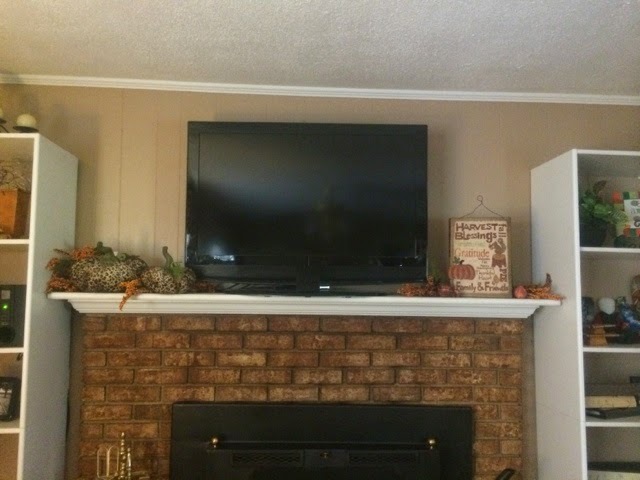 Finally, my favorite part-the mantle! I love this little sign. It came from a store we have called The Christmas Tree Shop. 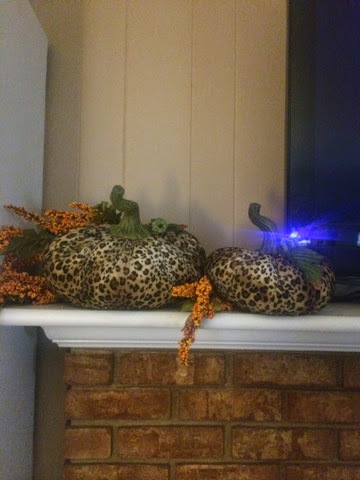 I eyed these leopard pumpkins last year at Michaels but they had hefty price tags at $30 and $24 each! I lucked out at the end of the season and got them at a great value. I've been waiting all year to put them out!